Upon reading these words, I swelled with joy. I have seen my client's posts on Facebook which show her riding and jumping bit-less and playing hide and go seek (video left) with her horse. Her horse clearly loves her as much as she loves him. It is adorable to watch their Centaur Connection and relationship that I have written about spring forth. This young woman allows her horse to be her teacher, validating her feelings and giving full expression to her inner voice. Although she may feel alone in her way of thinking, a long and fruitful future awaits this shining star! One of my most pivotal life lessons arose from the guidance of a horse who told me that as long as I sought answers from the outside, I would not be able to hear my own inner knowing. It is so true that sometimes we simply don't quiet ourselves to heed the wisdom within. Joyously, we are now entering the season of light! It is your time to shine as you boldly step forward in full expression of your own inner beauty. 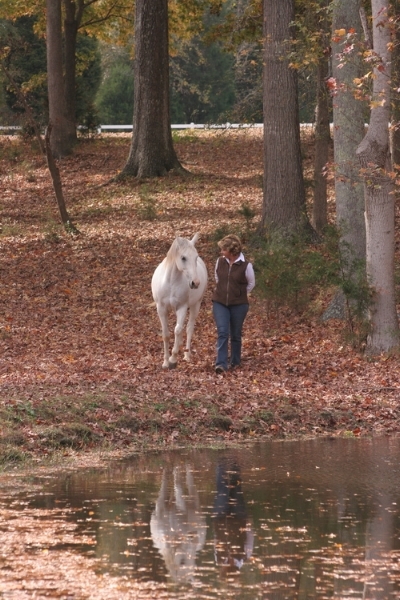 Your horse is always ready to cultivate the "diamond in the rough" that he sees in you! Are you ready as well?